Do you remember the time your little bundle of mischief was a tiny little infant, lying in his crib? Of course you do! Remember how his little face used to light up when he saw you and became all frowny when you were leaving the room? Well, that was the beginning of your child’s memory development! Of course, now that your little one’s way past the crib stage and on his way to school, you’ll have to try something more than peek-a-boo to develop his memory. As we’ve mentioned before, the best way to help kids learn anything is to play a game, even if it’s about exercising his memory muscles! We have just the thing for you, with not one, not two, but three Dinosaur Memory Game Printables – in full color and ready to print! 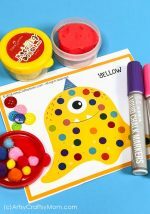 Print the Dinosaur Memory Game Printable sheets in color on an A4 / Letter size paper. It is recommended to laminate them so that even the young ones can play without fear of tearing. Cut out all the square cards separately. Each sheet has 20 cards each. You can play each game individually or mix them up to make it more challenging. If playing individually, keep each set of cards separate. Place all the cards of a set facing down. For very young children, you can place them facing up. Pick up a card and hold. Pick up another card and repeat till you find two matching cards. 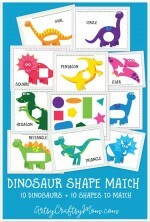 For the Dinosaur Matching Game, match each dinosaur with it’s mirror image. For the Dinosaur Shadow Game, match each dinosaur with its shadow. The player with the maximum number of matches wins! The best part about this game is that you can customize it to suit the child’s age. This game is great to develop not just your child’s memory, but color recognition and analytical skills as well. This is perfect for the whole family to play together, so get ready to flex those memory muscles! Oops! there has been some mixup. Help the dinosaurs locate their eggs. 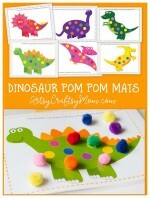 Match the dinosaurs with their eggs by color & pattern. Match the Color name card with the dinosaur. Count the number of eggs each dinosaur has [ numbers 1 -10] and match the corresponding number name cards. Finally, practice your math skills to sort them in ascending & descending order. 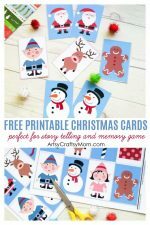 This is a fun game to involve multiple kids in a classroom. Make the class stand in a circle. Ask each child to pick up a big card. The child with the ‘Violet Dino’ card starts the game. He needs to announce that he has ‘Violet Dinosaur’. The child who has the matching egg should announce “One Violet Dinosaur Egg’ and quickly go join the child with the Dinosaur card thus forming groups of twos. Continue this till all cards are matched correctly. Each time announcing the color & number of eggs & dinosaurs. 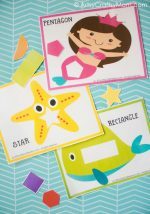 These printable brain exercises are great practice for developing the studying and memorization skills that preschoolers & kindergartners will need in later grades. 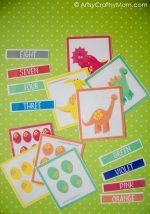 Bigger cards for use with small kids – 10 Rainbow colored dinosaurs + 10 matching egg cards, 10 matching color name cards & 10 number name cards. Bonus – matching dino footprint pattern page to print the backside of the cards. New & Improved version is available for purchase in our shop. Click button below. This looks so cute! Thank you for sharing.